By 2 pm the sun, still shining brilliantly, casts long, long shadows across the drowsy garden. Winter is mild and tends to wet rather than white. By mid-January there are signs of burgeoning life. A tiny lilac bud swells. Hydrangea petals, once sky blue, are now sere, faded, and skeletal. A rusting garden ornament stands amid hollow, brown stems. Irrepressible weeds still show a bit of green below. Life bursts from the floribunda rosebush. 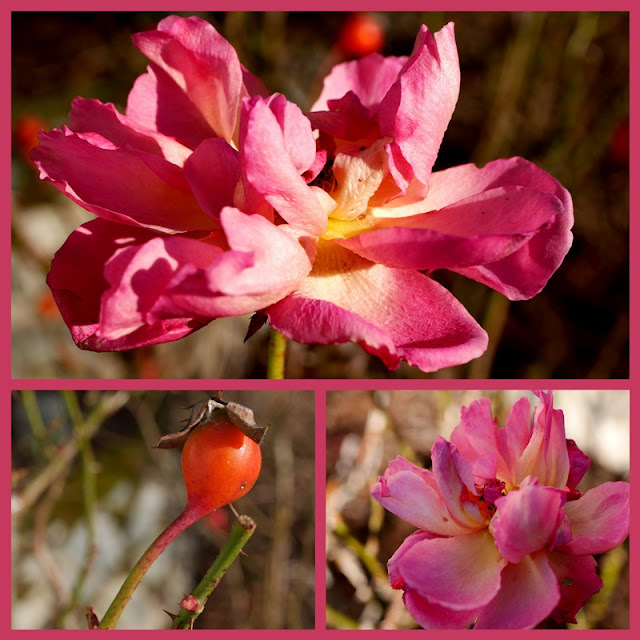 One rose, of the Heinz 57 variety, glows in the sunshine, a solitary bloom among the rose hips and leafless stems. I look for my patch of snowdrops, but alas, they have not yet appeared. I wonder what could have happened to them. Although the garden is slowly awakening, another month or two will pass before much happens. And in that time we might (I hope) see snow. But for this next week, rain is in the forecast, so I'm glad I enjoyed the sunshine today. Linking to Mosaic Monday, hosted by Judith. At the moment, out our window, the vista is white with snow. Today, it was melting. My hope is for an early spring! Thanks for sharing your garden in January. Your garden in January seems far ahead of the season, Lorrie. I will not see buds or blossoms till late May or early June. This has been a real winter so far--lots of snow and cold. I am enjoying it, however. Happy New Year! The winter garden has a beauty all it's own. It's a time of patient waiting and expectation - your snowdrops will pop up all of a sudden and so the rhythm and pattern of nature moves on. Lovely photos. In my garden there is much happening that shouldn't be yet I fear - the weather is far too mild and wet for January. I wonder what will happen to all the new shoots if/when the weather turns cold as it ought. I have been hunting for my snowdrops too, Lorrie, but hope they will eventually appear. Everything is so very wet here. Beautiful photos. It is so mild here that the grass is still growing but too wet to cut. Spring bulbs are starting to emerge which is worrying with a drastic drop in temperatures and frosts predicted later this week. My garden is a mess. It has gone from white to brown and sodden overnight. We are back to a "November look." Your garden looks ever so much more hopeful. It was so nice yesterday!! My son and I sat on the beach for a moment and let the sunshine warm our faces, it was great. I love watching the garden awaken too, every day now there's just a little more growing out there. We had such a mild December that Forsythia was in bloom and so were some ornamental cherry trees! I hope this doesn't mean an ugly spring for us! Your garden looks lovely. I love your crown ornament! This year I want to add a few more roses to my garden. Well, our garden is definitely asleep and won't be waking for months. How nice that you have a rose blooming and signs of spring in your garden though! Enjoy the week. I have a few roses in bud and the magnolia has some new growth...bulbs are popping up through the soil...it feels like Spring will be here soon. Lovely photos Lorrie...hope you have a great week. Way too much is happening around here as everything is three months ahead of the season!!! And if we get a late freeze (three years ago it snowed in March)...wow is that going to hurt for the farmers! Thank you for these pretty and thoughtful photos; Lorrie. Our daffodils peeked out after all our warm wet weather, and we had to mow the lawn again. The daffodils are stopped midway now and I wonder how they will fare in another month when they normally show their faces. Trees also started budding, though we barely finished raking up their dead leaves. Your photos, as always, are wonderful. Nice work with the lens, Lorrie. Being outdoors with the camera makes you very observant. I've not much idea what will be popping up in our small garden, as it has only been Autumn and winter since we owned it. I am watching each day how the sunlight (when there is any!) falls and 'travels' so that I'll know where to put things for the best in future. It feels a long way off Spring, but I have seen one small clump of snowdrops in a churchyard...only one. I am seeing some budding on the lilac and hydrangeas and on the rhoddies. I have to prune the apple and pear trees. Hope you have a lovely week. Lorrie, I just love rose hips. There is something magical looking about them. My garden is rather sleepy at the moment. We had a patch of warm weather a few weeks ago and some bulbs started coming up but then BOOM cold weather! I hope they had the sense to tuck their leaves back under the soil until spring arrives. Have a beautiful week. Hugs! Lovely photos. I have a few leaf buds on my lilac bush too. It is only three years old so I'm not sure it will bloom yet - they told me seven years - that's a long long time, but worth it. Not much else is showing anything in the garden - just a few leftover violas. Wasn't the weekend gorgeous? So nice to see life and new growth in your garden. Because of the unusual warm temps in December my window boxes of begonias just bit the dust. Never had annuals blooming here in December and January. Now we are fluctuating between very cold and warmer temps. Thanks to the mild temperatures, the grass here still actually looks green!. However, we're supposed to received some snow overnight and tomorrow. Hopefully, the morning commute won't be too bad! We had a few forsythia blooms in October and November. For the first time ever, Ron needed to mow the lawn in December. And until last week, I still had parsley in my herb garden. What?! Crazy garden happenings! Now that we've had some truly cold weather, things look more seasonal. Your garden is full of beauty, even in this dormant season! Beautiful garden ornament. My hellebores are greening up and looking like they are raring to go. Saw a lot of rhododendron buds looking to burst open as well. The garden sleeps underneath a blanket of snow. No peeking buds here yet. The snow will provide needed moisture as the plants begin to wake in March. I adore March. I'd prefer rain, too. I always imagin Canada buried under snow. Just how uninformed am I? Well, you and I aren't so far apart, but since the mountains separate us, our world here looks much different than yours... we have quite a bit of white still... and no hope of any buds appearing just yet... but how wonderful to enjoy your winter garden's awakenings... the loveliness of the single rose bloom, the beginnings of the lilac bursting forth in bloom, so wonderful! I enjoyed your garden, and the lovely thoughts you shared with each picture! Have a blessed day! I do have a few roses blooming again - and the camellias are pretty so I cut one now and then for the kitchen windowsill. I have good flat leaf Italian parsley now - amazing how it thrives bi-annually and in such chilly weather. I love cutting a fresh from garden bunch for soups etc. Your garden looks good for wintertime Lorrie - even sleeping buds and spent blooms can be beautiful - and I too love to take pix of them. Wonderful photos of flowers and sunshine, Lorrie! Your climate looks very charming indeed. As always, thank you for sharing the lovely images and words! There were some buds starting to swell around Christmas when the temperature was in the mid 40sF but they were in for a surprise when winter finally arrived. I've planted snowdrops a couple of times and I don't know what happens to them - eaten perhaps or dud bulbs - hope you find yours Lorrie. I love your descriptive words here, Lorrie. The photo of the dried hydrangea petals is stunning. It's so true...the poor little plants just don't know what to do! Like you, I am hoping for snow...any day now would be fine with me. Sorry I have not visited much. I was quite sick with bronchitis and sinus problems. Oh I love seeing what is happening in your garden. In my garden we are seeing the first signs of daffodils, crocus, lilies, and even buds beginning to open on the camellia. I get so excited when I see these first signs. Your rose made me smile. Now I will be checking the roses. I am late as usual, and yet I do catch up eventually. It is lovely to see the new signs of Spring along with those spent buds, flowers from the past season. I have dried Roses and Hydrangeas that I plucked years ago when fresh and just looked at them yesterday...remembering time then and looking forward to more in the future. I see Snowdrops under the trees as I walk through the neighbourhood and notice that bulbs are pushing up through the soil in my own garden. The oddest thing is the ivy geranium that I set down beside the house back in October - still blooming! I may not comment, but I read all your posts. I find them uplifting and heartening. Life is presenting many challenges these days, but I hope that things will soon settle! I love Winter gardens, and landscapes. The barren season has such a way of bringing a certain amount of joy to our lives. A time to reflect and embrace the simple beauty of life. Your photos are so clear and provide a new appreciation for winter gardens. A great idea to get out there and observe the little signs of life that are hard to see from inside looking out. We have a few Knock Out Roses still in bloom and a few clumps of white blossoms just popping out on one of our newer additions to the garden. Not sure what they are called, however.